Watermelon and lemon are two of the most refreshing flavors, and together, well they're just unstoppable! This is a great drink to serve at your next summer picnic. Make a lot, because it'll go fast! This just tastes like sunshine and summer. I found the recipe for this lemonade at Smitten Kitchen. I made a few proportion adjustments. This is a delightful lemonade that I would certainly recommend to anyone! 1. In a small bowl or glass, stir together the ¼ cup water and sugar. Microwave for 30 seconds, Stir. Microwave for 15 seconds. Stir until the sugar is completely dissolved (alternately, you can boil the mixture in a small pot on the stove). Transfer the syrup to a cool container. Place in the freezer to cool while you work on the remaining steps. 2. 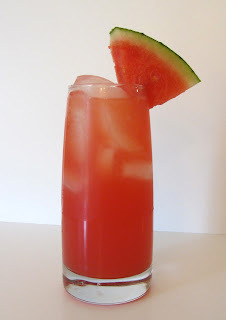 Pour the watermelon puree into a fine-mesh strainer set over a large bowl or pitcher. 3. Add the lemon juice to the watermelon juice. Add the syrup to the juice. Add the ¾ cups water to the juice. Stir well. 4. Serve over ice. Makes 2 glasses.